It was a Monday. 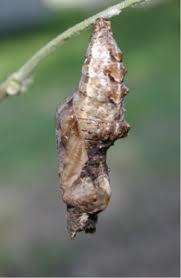 Allie’s caterpillars had gone into full chrysalis mode. The once live, moving, growing creatures were now still. If one didn’t know better, you might think the caterpillars were dead. Their outer bodies had become a protective shell, while inside they were busy readying for their next phase of life. When we arrived at hospice, her private room was beautiful. Decorated in soft blues, with a big TV and nice artwork on the walls, she had French doors that opened to the patio. It’s spring in Arizona and we opened her doors and she could see sunshine and blue sky, a welcome view after 6 weeks in the hospital. Mom relaxed into her bed and said, “I haven’t felt this serene in so long.” It felt so good to get out of the hospital. I went home that night so happy to see Mom disconnected from machines and at peace. I had been thinking about Mom’s “hard heart” and decided that it did not get the last word. So I spent my evening cutting out brightly colored paper hearts, so that all who visited could leave a message, write encouragement, share a memory. I wanted to plaster her wall with brightly colored hearts of love, my own kind of “heart attack” to let her “hard heart” know that LOVE conquers all. On Tuesday morning, I arrived with my tote full of hearts. Mom was freshly bathed (something they didn’t do for her in the hospital) and looked so peaceful and sweet in a pink nightie. I taped my completed hearts to her wall, right across from her bedside, where she didn’t even have to lift her head to see them. As family came to visit, one by one, the wall filled up. 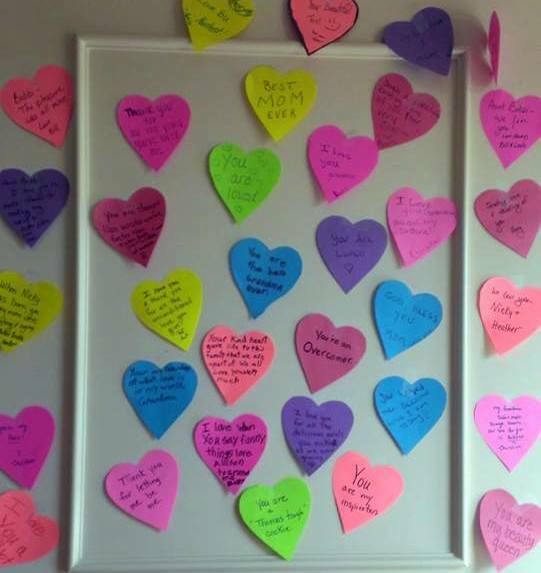 Even her nurses participated, leaving kind notes and taping a heart to the wall. Family and friends who lived out of state sent messages, which we transferred to a heart. It wasn’t long before the wall was covered with brightly colored messages. “See Mom,” I said, “You don’t have a hard heart, you have a heart full of love.” She smiled and nodded. On Wednesday morning, Mom was no longer conscious. My siblings and I began the task of 24 hour bedside vigilance. While Mom lay still and seemingly unresponsive; my sister and I played her favorite songs, we danced, we laughed, we read stories, we cried and we prayed. We savored every second. On Friday morning, I was informed that Medicare would no longer pay for Mom to be in the hospice inpatient facility and we needed to make arrangements to move her the 50 mile trek back to her home. It just didn’t seem right that she should go back to her beloved little trailer, her mansion, in an unconscious state. My brother and I both feared the trip would kill her. Just as I informed all the family of the situation, I was approached by the staff. It was just another roller coaster loop de loop. While I was busy calling family, the doctor had checked Mom and advised that they would keep her. Her condition had deteriorated. The doctor kindly told me that she didn’t think Mom would make it through the weekend. It was a Monday, February 17th to be exact, at 4:50 a.m. when my phone rang. My husband answered the phone and after a brief exchanged, handed it to me. Of course, I knew it was hospice. Losing a loved one is always so difficult. Losing your Mom is losing the cornerstone of your family. My heart aches for you and your family Jean. Please know you continue to be in my daily thoughts and prayers.